There is nothing more important than the safety of our employees. We have always known that our people are the cornerstone of our business and our safety culture is supported at all levels of the company. Our safety program is not just something that is in a book — it is the way we do business. Our consistent record of outstanding safety performance demonstrates our commitment to safety. 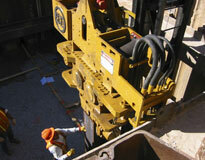 We are proud to say we had no lost time accidents in all of fiscal year 2008. For each of our projects, a site specific project safety plan is developed, taking into account the specific safety requirements and environment of the project. This plan outlines the responsibilities relating to safety for all parties on the project and establishes a plan for safety education and training. On all Manhattan Road & Bridge project sites, weekly “Toolbox Talks” are held with all employees where safe work practices are discussed. We also require that our subcontractors attend these weekly safety meetings and document that their employees attend as well. For all of our new employees, Manhattan has an employee orientation program. We are fully committed to a drug-free work environment through both pre-employment screening and random drug testing for all employees to the highest levels of the company.